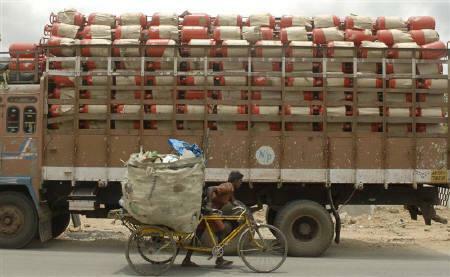 A rag picker pushes his cart past a truck loaded with gas cylinders on the outskirts of Hyderabad. Photograph: Krishnendu Halder. Cautioning that fiscal weaknesses continue to make India's sovereign credit profile vulnerable, global rating firm S&P today said a financial or a commodity "shock" may unwind the improvements made so far. Without further fiscal reforms the government may find it difficult to sustain the increase in public investment spending, it said. "Structural fiscal weaknesses continue to be vulnerabilities of Indian sovereign creditworthiness, Standard & Poor's Credit Analyst Kim Eng Tan said. US-based S&P has a 'BBB-' rating on India with a stable outlook. It is a speculative investment grade, just a notch above the 'junk' status. Global investors often refer to the credit ratings of the markets while pumping in funds there. S&P said: "Although India's budgetary performances have strengthened in recent years, its hard-won fiscal improvements could yet unwind because of a financial or commodity shock." In its report -- 'India's Fiscal Roadblocks Could Stall Infrastructure Progress' -- S&P Ratings Services said that despite measures for fiscal prudence, subsidy expenditure and high government debt remained concerns. "Without further fiscal reforms, the Indian government may find it difficult to sustain the increase in public investment spending," it said. Tan said the government's willingness to cut spending to rein in the budget deficit indicates the high priority of fiscal prudence on its agenda. "From an institutional and governance point of view, this supports the sovereign credit rating on India," Tan said. Last week, Moody's had raised India's credit outlook to 'positive' -- raising hopes for an upgrade in its sovereign rating in the next 12-18 months, while another global firm Fitch projected faster growth. S&P said subsidy spending is one key source of weakness, despite fuel-subsidy reforms in 2014 and another constraint is the heavy government debt. It added: "The large interest payments and subsidy spending in budgetary expenditure are signs of fiscal risks because they leave little for the central government to spend at its discretion, after necessary social services expenditure." Government's relatively small share of GDP that it collects as revenue further constrains public infrastructure financing. "This is why public investment in India has been persistently lower than that of some other developing countries." According to S&P, an unexpectedly sharp increase in interest rates could still raise India's budgetary interest payments. "Similarly, if food and fertiliser prices are markedly different from assumed levels, the subsidy bill could be larger than expected. In either scenario, particularly if divestment targets are also not met, the government could find it necessary to cut capital spending again to meet its deficit target," it said. FinCom's steps: Will they help India bridge fiscal deficit?